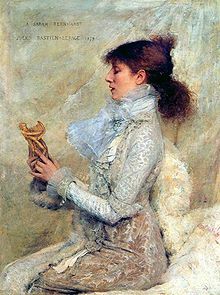 Sarah Bernhardt (23 October 1844 – 26 March 1923), born Marie Henriette Bernardt, was a French stage actress. Bernhardt is regarded as one the finest actresses of the 19th century, and was the first actor to become a worldwide celebrity. Also known as "The Divine Sarah". We ought to hate very rarely, as it is too fatiguing; remain indifferent to a great deal, forgive often and never forget. Bernhardt's motto, a versatile french phrase meaning "anyway, nevertheless; really; how about that; finally"
Once the curtain is raised, the actor ceases to belong to himself. He belongs to his character, to his author, to his public. He must do the impossible to identify himself with the first, not to betray the second, and not to disappoint the third. And to this end the actor must forget his personality and throw aside his joys and sorrows. He must present the public with the reality of a being who for him is only a fiction. With his own eyes, he must shed the tears of the other. With his own voice, he must groan the anguish of the other. His own heart beats as if it would burst, for it is the other's heart that beats in his heart. And when he retires from a tragic or dramatic scene, if he has properly rendered his character, he must be panting and exhausted. Me pray? Never! I'm an atheist. Acting is all internal, but must be externalized. Life is short, even for those who live a long time, and we must live for the few who know and appreciate us, who judge and absolve us, and for whom we have the same affection and indulgence. I am so superstitious that if I had arrived when there was no sunshine I should have been wretched and most anxious until after my first performance. It is a perfect torture to be superstitious to this degree, and, unfortunately for me, I am ten times more so now than I was in those days, for besides the superstitions of my own country, I have, thanks to my travels, added to my stock all the superstitions of other countries. I know them all now, and in any critical moment of my life, they all rise up in armed legions for or against me. I cannot walk a single step or make any movement or gesture, sit down, go out, look at the sky or ground, without feeling some reason for hope or despair, until at last, exasperated by the trammels put upon my actions by my thought, I defy all superstitions and just act as I want to act. She is the Muse of Poetry herself. Neither intelligence nor artistry have anything to do with it. She is guided by a secret instinct. She recites as the nightingale sings, as the wind sighs, as water murmurs, as Lamartine once wrote. A symphony of golden flutes and muted strings; silver dawn lit by lambent lightnings, soft stars and a clear-cut crescent moon. "Sarah Bernhardt : The Art of High Drama"